I am a part-time consultant, part-time stay-at-home-dad, and freelance cultural and political commentator who resides in the Baltimore area. You won't find me in a phone book, though, because I write under a pen name. 2. How would you describe your political views? Briefly, I am a realist, secular, and selfish pro-capitalist. Since my political views are based on my more fundamental philosophical views, I would describe myself more completely as an advocate of Objectivism, the philosophy of Ayn Rand. By that, I mean that as far as I understand Ayn Rand's philosophy, I fully agree with it. That said, I do not hold myself out as an authority on Objectivism. If that's what you're looking for, I refer you to the good people at the Ayn Rand Institute. 3. Why do you use a pen name? I use a pen name for two primary reasons: First, it makes it easy for me to keep my scientific and legal career neatly separated from my writing career. Second, "Gus Van Horn" is much more marketable than my real name. Not only is my real name as common as dirt, there are at least two celebrities -- one of whom is a popular writer -- who share my real name. 4. How did you come up with such a fine pen name? Most of the story is explained in my first post. Basically, as part of a running joke, I was reinventing myself as "Gus," and I was a "trial lawyer from west Texas." The "Van Horn" came later (but as part of the same joke) from a mental association of mine. 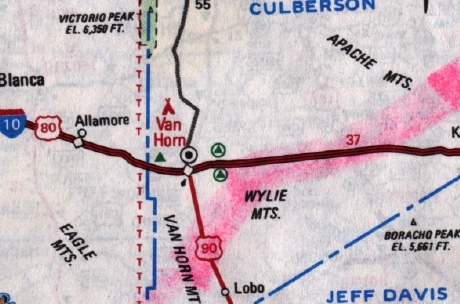 Needing a last name and transposing a town name (Van Horn) for a county name (Jeff Davis) in my mind's eye, I pulled up "Van Horn County" in west Texas and took its name as my last name. A scanned image of the very map is shown below. 5. Why do you sign all your posts "CAV?" Aren't your initials "GVH?" It's for Caesar Augustus Van Horn, of which "Van Horn" is a last name. 6. What are your blog policies? I have them, but choose not to list them in any great detail. I will mention a few things, though. First, my general link policy is as follows: Links from this site to others are strictly for my own convenience. The fact that I have provided a link to another site does not in any way imply an endorsement of that site or a guarantee that its content will remain unaltered after the time I provided the link. Second, regarding blogroll links: If I think that my inclusion of a link on the blogroll could reasonably be taken as an endorsement on my part of a factual, theoretic, or philosophical position that I regard as wrong or arbitrary, I will not include the link. I will err on the side of caution if, for some reason, I am unsure about any aspect of the matter. That said, I will discuss my reasons for including or not including a site only if and when I deem it appropriate to do so. Third, while I generally try to moderate and answer comments in a timely manner, time constraints do sometimes cause long delays in moderation and keep me from answering some comments. I rarely reject comments, but when I do, it is usually for gross breaches of etiquette or spamming. Finally, please see my email policy below, under Item 9. 7. Is that sketch on your blog's masthead supposed to be you? Yes, and it has a funny story behind it. I was blogging late one night when my wife interrupted me to ask a question. When I get going good, I can sometimes be quite testy when interrupted. She left the room after the interruption and came back grinning awhile later with a drawing titled, "The Bitchy Blogger". I liked it so much I decided to scan it in and use it for my new masthead. It worked out very nicely for me, too. Some form of that drawing has been a part of my blog's masthead ever since. 8. What is your favorite post of all time? Hands down, it's the one I wrote about my Dad on Father's Day in 2005. 9. How can I contact you? Flip around and decode the below for my email address. Also, please read the below before contacting me. Any and all comments submitted to this blog or email sent to me is subject to verbatim publication on this blog or wherever else I wish. Also, while I prefer to answer contact inquiries and emails, I am extremely busy and cannot guarantee that I will reply or that if I do, it will be in a timely fashion. Please accept my apologies in advance for this circumstance. 2-11-16: Revised Item 1 to reflect current locale.